NACOGDOCHES, Texas - The Wind Symphony at Stephen F. Austin State University will present "Red Sky," a concert featuring the music of J. Clifton Williams, Anthony Barfield and Steven Reineke, at 7:30 p.m. Monday, April 30, in W.M. Turner Auditorium on the SFA campus. 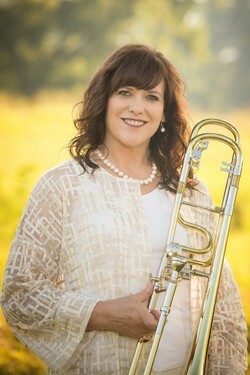 Dr. Deb Scott, professor of trombone in the SFA School of Music, will perform on Barfield's composition for trombone and band, "Red Sky." "'Red Sky' is, in the composer's words 'a mere representation of The Big Bang Theory,'" said Dr. David Campo, associate director of bands at SFA and director of the Wind Symphony. "As history tells us, the Big Bang is a theory that explains how the universe expanded from one single point. This work focuses on space, matter and energy as a whole," according to the composer's website at abarfield.wixsite.com/barfieldanthony. After Barfield moved to New York City from his native Mississippi to pursue trombone performance, he quickly emerged as a composer. Recognized for his lyrical writing style, Barfield's compositions have been performed throughout the United States and Europe. Barfield has received commissions from trombonists including Joseph Alessi, principal trombonist of the New York Philharmonic, and Steven Lange, second trombonist of the Boston Symphony, as well as for the Manhattan School of Music Brass Orchestra and other ensembles. Scott enjoys an active schedule as clinician and performer in both classical and jazz styles. Her solo CD, "Playing Favorites," was released in 2017. She has been called "one of the premier soloists for her instrument" by Cinemusical. The Wind Symphony will open the concert with Williams' march "The Hermitage," written on commission for the Future Music Leaders of America organization in 1975. Originally titled "March FMLA," the march was composed one year before the composer's death, Campo said. "Williams was fond of the concert march, composing many memorable pieces in this form, including 'The Sinfonians,' 'Strategic Air Command' and 'March Lamar,'" Campo said. "This march exhibits Williams' trademark march style utilizing bitonality, obligato flute lines and fanfare trumpet flourishes." Closing the concert is Reineke's "Symphony No. 1 - New Day Rising." The work is in four movements, each describing an aspect of the April 18, 1906, earthquake in San Francisco, which, along with the subsequent fire, leveled the city, costing millions of dollars and thousands of lives.